My new puppy, Betsy, enjoying one of 'Betsy's Chew Squares' (see recipe below). High-quality treats can cost a fortune these days, but you can make superb ones of your own much more cheaply. These recipes range from non-bake quick treats to nutrient-dense baked mini-meals that could be useful as dinner substitutes or snacks while travelling. The cooked ones also serve very well as toppings for kibble. They have all, of course, been tastebud-approved by our very discerning dog tester, Chummy. The recipes all take into account not only the need for great flavour but also the nutritional balance of protein, fat, and carbohydrate, and the benefits of dairy products, which include protein, calcium, and helpful enzymes. All of the foods and ingredients are widely understood to be not only safe for the dog’s physiology but just as essentially, good for their well-being. Please note that some dogs are allergic to certain ingredients, even though others are fine with them. Dogs may also take time to adjust to a new ingredient, so it’s better to start off with small amounts. Watch your dog carefully the first time you give a new food. Also, be aware that the small amounts given in these recipes — particularly of spices, berries, and garlic — should not be multiplied because higher quantities can do more harm than good. If in doubt about your own dog’s food tolerance, naturally you’ll contact your vet. But I hope that your dog will simply enjoy these treats as much as mine does. Of course, you are always free to leave out an ingredient or make the substitution of your choice. Dogs like warm food, but just be sure that whatever you give is not burning hot from the oven! For my dog, I add powdered cayenne pepper to the more savoury treats, or else a mild cayenne pepper hot sauce (either Louisiana’s Crystal hot sauce or Frank’s RedHot). I indicate where hot pepper might be a nice fillip, as an option, if you think your dog would like it. Raw honey and plain genuine maple syrup are safe for dogs in small doses — but of course sugar is always fattening, as well as being bad for everyone’s teeth. I advise a good brushing with dog toothpaste on a frequent basis — every day is not too often — especially after giving sweet treats. Finally: If you refrigerate unused cooked treats, you might want to gently heat them again before serving: makes them even tastier! You’ll notice that I mention a lined baking tray when cooking and then a cooling rack afterwards. By a “lined baking tray” I mean one with its base mainly covered with tinfoil or parchment paper — not wax paper: it’s not oven-safe — or even a silicone baking mat. The tray, cookie sheet, or roasting pan can be metal or glass; if using a ceramic tray, you may wish to reduce the baking temperature slightly because of the rapid way that ceramic conducts heat (and leads to faster browning or burning). Lining a tray and using a rack gives you a few benefits. 1. Sliding the baked goods onto a rack is more easily done when there are on a sheet that you can lift away. 2. Cooling on a rack is preferable to leaving goodies on the hot tray, since it allows the food to cool more quickly and dry more thoroughly (they will tend to sit in condensation if left on the tray). 3. Cleaning up is easier. If you have any questions about what is good for your dog, it may be helpful to consult the American Kennel Club online: it has a web page that discusses specifically, though not exhaustively, foods that dogs can eat. Berries: Blackberries, blueberries, and raspberries are all healthy choices for dogs, but I use only a few in any recipe that includes them — partly to keep the nutrients balanced and partly because too many can upset a dog’s stomach. A little goes a long way. As for humans, the antioxidant character of berries has a protective effect for dogs. Cheese: Contains almost as much protein as fat, and almost any sliceable cheese will be fine in these recipes — if coloured white, yellow or orange. Avoid blue cheeses and rich soft cheeses (though note that goat’s cheese is a low-lactose choice). If in doubt, stick with Cheddar or Parmesan: they have trace amounts of lactose and are generally well digested. Chickpea flour: Also known as garbanzo bean flour and, in Indian cooking, besan, this finely ground powder is a great alternative to wheat flour because it is protein-rich and adds flavour in its own right. Chickpea flour is very soft and less grainy than wheat flour, which means that you’ll get more of it in a measuring cup than you would do if scooping up wheat flour. For greatest accuracy, weigh the flour — but note that these particular recipes are very forgiving, so strict accuracy is not terribly important. 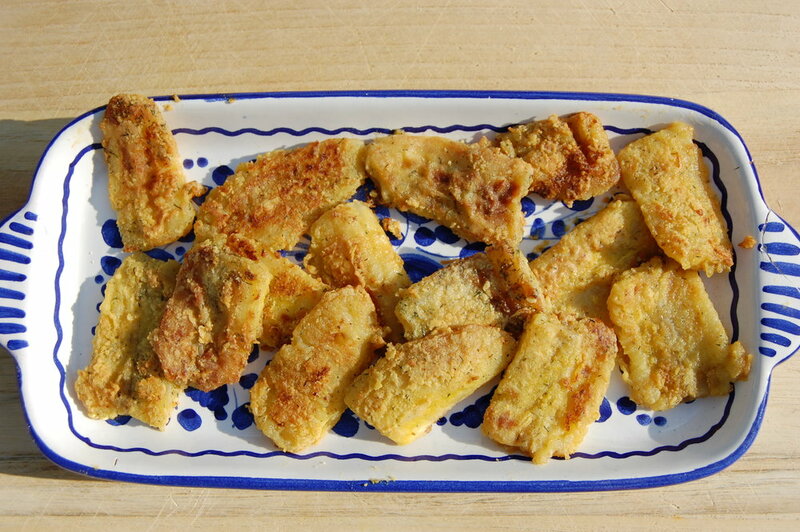 Chickpea flour is a great substitute for most wheat recipes in general. If you wish to make choux paste, however, you should stick with all-purpose wheat flour, the reason being that gluten is essentially to its ability to rise. Choux paste: This is a soft pastry dough made from butter, flour, and eggs, and is very versatile even for dog treats. You can’t substitute other flours because their protein content makes them too ‘heavy’ and their lack of gluten prevents the rising that is essential to choux paste (think of fluffy éclairs, which rely on this pastry). Choux paste is easy to make, and I give full directions below. It is not a make-ahead-of-time pastry, so be sure to add the other ingredients soon afterwards and bake it without much delay. Honey and maple syrup: Sugar as we know it is not a good idea for dogs, but a little genuine honey or completely natural maple syrup adds flavour and won’t do any harm, especially in the tiny quantities these recipes occasionally suggest. The honey ideally should be ‘raw’, meaning that it has not been filtered of the trace nutrients that make it healthier than table sugar; and maple syrup should be concentrated tree sap — and nothing else! I also advise buying locally sourced honey whenever possible, which is another assurance of quality. Yoghurt/yogurt: Most dogs will have no trouble digesting plain yoghurt, which is good for their digestive health and urinary tracts. I mention Greek yoghurt in one recipe because it is thicker and less liquid than other yoghurt (that is the only difference), but feel free to substitute whole fat or low fat yoghurt instead, perhaps allowing a longer baking time. Greek yoghurt has more protein and fewer carbohydrates than other forms of yoghurt — but make sure, whichever type you choose, that it doesn’t have anything in it apart from milk and the live active cultures: no sugar, whey concentrate, or cornstarch, please! A note on baking: For all the oven recipes, the oven rack should be placed in the middle position. If the rack seems slightly below the absolute middle of your oven, you’ve got it in the right place. You’ll notice that I mention a lined baking tray and then a cooling rack afterwards. By a “lined baking tray” I mean one with its base mainly covered with tinfoil or parchment paper — not wax paper: it’s not oven-safe — or even by a silicone baking mat. The tray, cookie sheet, or roasting pan can be metal or glass; if using a ceramic tray, you may wish to reduce the baking temperature slightly because of the rapid way that ceramic conducts heat (and leads to faster browning or burning). Lining a tray and using a rack gives you a few benefits. 1. Sliding the baked goods onto a rack is more easily done when there are on a sheet that you can lift away. 2. Cooling on a rack is preferable to leaving goodies on the hot tray, since it allows the food to cool more quickly and dry more thoroughly (they will tend to sit in condensation if left on the tray). 3. Cleaning up is easier. Pour chicken or beef broth into cube tray, and when frozen push a few out into an unbreakable bowl (here I have used a silicone cake pan). Couldn't be simpler and will keep a teething puppy in particular well entertained, or any dog on a hot day. Finely dice the apple (so the cubes are roughly ¼ of an inch across). Mix with a similar quantity of peanut butter. In a mixing bowl, combine one part peanut butter (natural with a good amount of natural oil) with two parts coconut flour, rolling the peanut butter around until the flour is incorporated. Add salt and honey, if using. Break into bite-size chunks and roll in the shredded coconut until covered. Store in an airtight container and serve in a bowl. This recipe is quick and involves no baking: just mix in a bowl and serve. If using an apple, peel, cut into halves, core, and use a coarse grater on about ¼ of the apple, or a bit less if you’re not including berries. (Seal the rest of the apple in the fridge and add to your dog’s meals etc.) Wash the berries and if they’re refrigerator-cold, consider heating them slightly in the microwave until purple (at least 20 seconds on high power): this will enhance their flavour. If using raspberries or blackberries, simply heat gently till warm to the touch. Mix crushed or puréed berries with the yoghurt, peanut butter, coconut oil, grated apple and sweetener, if using: serve immediately. Tear or cut parchment paper into rough squares about 5 or 6 inches across (you can re-use the same squares if you want). Take three or four cheese slices and place these in the center of the paper, so that they form a small rectangle. Transfer to the microwave and cook on High for 40-42 seconds. Repeat, until all slices have been cooked. NOTE: Don’t attempt to cook all the cheese at once. Serve when cooled and store unused portions in the fridge. A very easy treat to make. For preference, select bananas that are ripe but still have a bit of green visible on their skins. This will mean that they retain firmness, freshness, and that slight banana tang that is so delightful. I add dill weed to one of the variations on this recipe because dill weed is a subtly sweet herb that goes well with the fruit. Using a wooden spoon (one with a small head), scoop the chickpea flour into a ¼ cup and pack down with the spoon. This is the minimum that you need to coat the bananas, but feel free to use more flour if that’s easier. Spread the chickpea flour evenly over a plate and break up any clumps with the back of the spoon. Sprinkle the dill weed over the flour. Quarter the bananas crosswise, and then cut each piece in half and either slice these for flat fritters or cut into wedges. The shape of the pieces doesn’t matter. Dredge one banana in the flour, turning over all the pieces to coat thoroughly. In a large frying pan, on a high setting, heat one tablespoon + one teaspoon of oil and place the floured banana pieces in a single layer over the pan. Turning down the heat to a medium setting, move the banana pieces around with a spatula to ensure that they all absorb some oil. Turn up the heat again and after a couple of minutes, turn over the pieces as the bottom begins to brown and the flour cooks. Add peanut butter to the pan, if using. Keep turning over and moving the fritters around until they become generally golden brown: some pieces will be lighter than others and that’s fine. Remove the slices from the pan and allow them to cool on another surface in a single layer. Wait about ten minutes before serving and test on yourself if you are not sure about the temperature: these fritters are hot! Promptly store any uneaten portion in the refrigerator. Take 1 large or 2 small medium-toasted bread slices, and cut into strips about 1 inch wide. Beat a large egg with a pinch of salt — and, optional — blend in finely snipped fresh parsley or dried parsley flakes, about 1 teaspoon. Slick a large frying pan with ½ teaspoon butter (a slice from a butter stick about 1/16 of an inch), or ½ teaspoon coconut oil or olive oil. Pour the egg into the pan and lay the toast on top. Turn the heat to medium-low or medium, if using an induction cooktop. Quickly turn over strips with a spatula or tongs to coat both sides. Adjust the heat as needed and push the strips around the pan till the egg is absorbed and cooked on both sides. Allow to cool before serving, with or without a sprinkling of mild cayenne pepper sauce. Store in the fridge. If you bake, you’ll know that sometimes the recipe calls for an egg yolk, all by itself — or for egg whites (as with making meringue), which leaves you with egg yolk left over and nothing to do with it. My advice: don’t throw the egg yolk out. Freeze it, in half a shell just as it was when you separated the white, in a small upright container so the yolk doesn’t spill. Put a slip of paper in the container to indicate the date: egg yolks can keep for several weeks. Then when you want a treat for your dog, defrost and cook the yolk in a bit of oil. Then it will be ready for this treat. Obviously you can also use fresh yolks from recent baking, as well. Pan-fry the yolks in a bit of oil or butter, mix in a bowl with the yoghurt, and add seasonings if desired. Serve immediately. Grate the zucchini or summer squash into a medium mixing bowl. Chop or grate the apple. Mix in 1 cup of chickpea flour, blending well to coat the fruit and veg. Add the salt and paprika, about 1/8 teaspoon of each. Mix in the egg, blending well. Line a baking sheet or tray with parchment paper. Use a spatula or bowl scraper to gather the egg-veggie paste, and smear it as evenly as you can, about half an inch thick, onto the parchment. Put in the middle of the oven, turn the heat to 350°F, and let bake for 10 minutes. Remove the tray, and use a large knife to cut the 'pancake' into strips each way, about 1 inch thick, to make squares. Offer some squares when cool enough to eat, and refrigerate the rest in an airtight container. This eggless treat is a good choice when your egg count is running low. Everything is mixed in the food processor, so it’s easy to make and to clean up afterwards. Peel, core and purée the apples in a food processor. Add the other ingredients and mix well. Spoon onto a parchment-lined baking tray in rounds between 2” and 2½” across. Bake at 350° for 30 minutes until golden brown. Slide parchment paper onto a cooling rack to dry further and cool. Break up into pieces and serve in a bowl. Roughly chop up the apple, then dice in a food processor till the pieces are small but not a purée. Grate the carrot into the mix and pulse again. Place in a large mixing bowl, and add the besan, coconut flour, and seasonings, stirring together. Add one egg, and mix. Add the second egg. Pre-heat oven to 350°F. Line a baking sheet with parchment paper. Form balls of the mixture and press down to make cookies at least 2 inches across. Bake for 22-25 minutes, until the cookies are lightly brown or darker brown at the edges. Cool on a rack and store in a cookie tin. Mix the ingredients well, starting with the dry ones and adding the eggs, juice, and oil. When all ingredients are combined, squeeze small amounts of the mix together tightly in your hand, not making balls but more oval pieces almost the shape of stubby rice. Lay out on a baking tray. Pre-heat oven to 350°F and bake on the middle rack, about 12-15 minutes or until edges are golden brown. Hand-grate or purée the carrot in a food processor. Peel, core, and roughly chop the apples and put the carrot and apples in a large covered heavy-bottomed pot over medium heat. Cook for about 20 minutes, stirring occasionally. When the apples are a bubbly pulp, remove from the heat. Stir in ½ teaspoon cinnamon and the same quantity of cilantro or other herb if using, and 1 teaspoon of honey — first slicking the spoon with a tiny amount of cooking oil to allow complete release of the honey from the spoon. Add the salt, mixing well. Heat the oven to 170°. Spread a large (unlined) baking tray fairly thickly with the apple-carrot mixture, so there is a margin of about two inches around the spread; alternatively, use smaller trays and place them in the oven side by side. Place on the lowest rack in the oven and allow to dry for about 6 hours. Remove from the tray when cool, using a bench scraper if needed to lift the fruit ‘leather’. Cut into small squares and serve some with yoghurt or as a topping for a regular meal. Refrigerate the rest in an airtight container. There are three versions of these muffins. The first one has grated apple; the second has berries and is crumbly; and the third has more yoghurt, adds cheddar cheese, and is dense and not crumbly. For the variations, see the notes asterisked below the ingredients list. This recipe doesn’t use baking powder. *Version 2 and 3: Use blackberries, raspberries, or blueberries, about 1 cup (4.7 oz): If using blackberries, cut them up into small pieces. *Version 3: Add an extra ¼ cup yoghurt. Generously oil a muffin tin or bun tray (you’ll need 8-12 wells, depending on their depth). In a large bowl combine the oil, honey, salt, and eggs and whisk them until well mixed. (Don’t be concerned if your coconut oil or butter remains lumpy.) Then add the yoghurt. Into this bowl grate the apple, if using, or cut up the blackberries and raspberries into smaller bits, or just add the blueberries as they are. Gradually mix in the flours, preferably with a silicone spatula to help scrape the bowl, combining all the ingredients well. Lightly spoon the mixture into the muffin tin, not filling each well completely. Bake 20 minutes or a bit longer (muffins should look slightly speckled brown on top). Allow to cool on a rack before serving. Store unused muffins in an airtight container. This is a good recipe if you have leftover roasted parsnips; otherwise, peel and slice a number of them into pieces no thinner than an inch, and roast them in an olive-oiled roasting tin in a preheated 425°F oven for half an hour on a middle-to-lower rack or until tender, turning mid-way through and watching that they don’t burn. Meanwhile, get your Brussels sprouts. First, choose ones that are similar in size because this affects cooking time. Prepare them by slicing off the dry stem ends and making a deep cut in the base of the larger ones (without splitting the sprouts in half) to help the heat penetrate while cooking. Small sprouts don’t need the cut. Remove any tough or undesirable leaves. Pour at least 2 inches of water in a medium saucepan, lightly salt the water, cover and bring water to a full boil, then reduce heat to a less vigorous boil over medium heat. Set timer and continue to cook till tender, about 8 minutes for small sprouts and up to 10 minutes for large ones. When you put a knife in them, the knife should glide smoothly in and they should emerge from the water still a bright green but well cooked (we don’t want crunchy sprouts for this recipe — or in my opinion, ever!). Don’t throw out the water, which is full of vitamins: retain 1⅓ cups and immediately pour in the same quantity of potato flakes. (If the water has cooled too much and isn’t hot, briefly reheat it with the saucepan lid on before adding the flakes.) Use a spatula to mix the flakes into the water until you have a creamy paste. Add the 3 tablespoons of yoghurt and the ginger and paprika, if using. Mix well. Line a baking tray with parchment paper or use the roasting pan you cooked the parsnips in: you just don’t want the patties sticking. Using a normal tablespoon, form balls and flatten them gently into patties on the tray or pan. You should have at least 11 patties. Place tray in the oven and allow to bake for 30 minutes before turning the patties over with an offset spatula. Bake for another 15 minutes. Remove from oven and let cool for at least 15 minutes before serving. Store unused patties in an airtight container in the fridge. If boiling, put the eggs in a saucepan and cover completely with cool water. Bring to the boil, reduce heat so that the water bubbles moderately, and set the timer for 8-9 minutes (you want a cooked egg but not one that is too dry, as it will make the ball-making more difficult, especially if you opt not to include mayonnaise). Meanwhile, grate the chicken into a mixing bowl and season with the suggested spices and herbs. My recommendation is about 1/16 of a teaspoon of each item, just enough to impart flavour. Transfer the eggs immediately when done to a bowl of cold water, preferably with ice cubes added to stop the eggs from hardening further. When they are cool enough to handle, peel the shells and grate the egg white all around into the mixing bowl, and let the whole of the egg crumble into the bowl. Or use a masher, if you prefer. Find an airtight container sufficient to hold the finished balls, and have it ready. In a separate bowl, measure out at least ⅓ cup of coconut flour, for dredging the balls. Squeeze the chicken-egg mixture into a small ball (no bigger than an olive-oil jar cap), and cover it with the coconut flour. If the mixture seems too dry to come together, add a squirt of mayonnaise or some freshly grated cheddar to moisten it. These additions will also make a richer (though more caloric!) treat. Place each floured ball into your storage container. Serve to your dog in a bowl: I suggest breaking the ball up for small mouths. Store any remainder in the fridge and use up within a few days. Mix all ingredients and spoon out in cookie-sized dollops on a parchment-lined baking sheet, about 2 inches across (it will be quite wet so don’t try to be particular). Bake at 350° for 26-28 minutes, or until golden and very lightly brown. (If there are any black bits, cut them off.) Allow to cool slightly on a rack before serving. This treat consists of veggies, yoghurt, cheese and bit of mayonnaise, and is great for using up leftovers if you have been making soup, broth, or a stew. If you don’t have carrots and celery, however, you can substitute the quantities with any combination of spinach, green beans, peas, corn, broccoli, or cauliflower. Wash and scrub the potato: if the skin is tender and easily cleaned, there is no need to remove it. If you want to skin it, see instructions below. * Cut into chunks about 2” across. Place in a medium-large pot and cover with salted water (about ¼ tsp salt). Bring to a boil and keep boiling rapidly for several minutes until the potato feels soft and splits easily when prodded with a fork. Drain the water. Meanwhile, wash and scrub one small carrot (or peel the skin if it is thick or dusky-looking rather than bright orange). Shred it with a grater. Wash and dry a small segment of celery and dice it finely with a sharp knife. Grate 2 oz of cheddar or similar hard cheese, and sprinkle over the potato chunks. Add the yoghurt, mayonnaise, paprika, pinch of salt (⅛ tsp), and mash it all into the potato with a masher. Combine the celery and carrot with the mash till well mixed in. Using a regular tablespoon, spoon the mash mix onto a parchment-lined baking tray in large dollops. I suggest making 7 or 8 mounds of about 1½ - 2 inches high. Bake on the middle rack of a 350° oven for 25-30 minutes, until the tops have slightly browned. Allow to cool before serving. Store in the fridge in an airtight container. *Boil the cleaned potato whole for about 7 minutes, then keep the water but remove the potato to cool. When the potato can be handled, peel away the skin with your fingers. Cut the potato as directed and return it to the boiled water to cook through. In a food processor, mix the cooked rice, drained tin of fish, and jarred gravy. Add the seasoning, if using. Form loose balls about 1¼ inches across and deposit on a lined baking tray. Press down lightly with your fingers to flatten them into 2-inch patties. Place squares of cheese on top of the patties. Bake at 325°F for 25-30 minutes, until crispy. Remove and allow to cool before serving. In a medium saucepan, mix the coconut flour, shredded coconut, all the oil, and cinnamon and salt. Place on a low to medium-low heat, then add the water a little at a time, blending with a spoon or spatula to make a sort of rough paste. Crack the eggs in one at a time, stirring and blending well. Add the chicken to the mix. Take the saucepan off the heat. Line a baking sheet with parchment paper, if using. Scoop clumps of the mixture with a large spoon or curved spatula and make into slightly flattened patties, about 2½” across. (You’ll end up with about 9 patties.) Place in the middle rack of the oven and bake for 30 minutes, until golden. Allow to cool for a few minutes before serving in a bowl — these will be crumbly, and you may wish to break them up into quarters for your dog. Refrigerate any unused portions. This recipe was inspired by the smoothies that may not look odd but taste fantastic and are loaded with nutritious goodies. We bake this smoothie so you can give it whenever convenient, and it’s got an egg. In a food processor, purée the apple and then add the other ingredients. Spoon out onto a baking tray with a regular tablespoon into dollops about 2½” - 3” across. Place in a 350° oven for about 30 minutes. Allow to cool on a rack after removing from oven: serve warm. Refrigerate unused portions or store in an airtight container at room temperature. The last three recipes all use an egg-flour-butter batter called choux (pronounced ‘shoe’) paste or pastry. The paste is easy to make, and I give a tutorial here on how to make it. The choux-based recipes follow. A full quantity of each recipe makes 10 servings, but you may wish to split the recipes in half, using half the choux paste for each. Note that the recipe for Cheesy Egg Cakes has one less egg in the paste. Named for my dog. Grated parsnip with brussels sprouts or kalelettes (a kale-brussels sprout cross) and egg. Roast parsnips at 425° for about 20 minutes (there is no need to pre-heat the oven), moving the pieces around mid-way through to make sure they’re not sticking and to make the browning more even. Makes about 9 balls about 2 inches across. Bake the balls at 350° (the oven will be nice and hot so no pre-heating needed) for about 15 minutes. A blueberry blob, behind, and a chicken heaven cake. Choux paste: 3 large beaten eggs, 5. 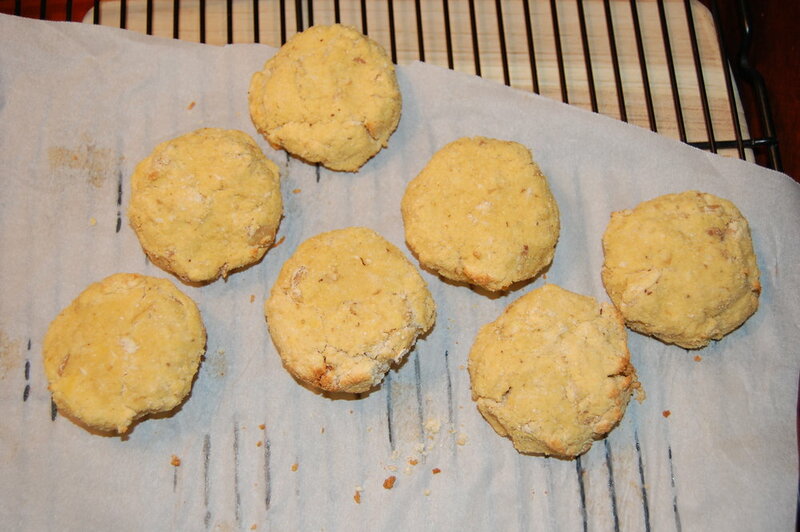 2 oz chickpea flour or all-purpose flour, 250 ml water, ⅛ tsp sea salt. Make the choux paste and set aside. Mix the chopped chicken and green beans in a bowl with a tiny pinch of salt and cayenne pepper, if using. Place the green bean-chicken mixture on top of each paste ‘platform’, in the center. Pre-heat oven to 425°. Cook for 15 minutes, then reduce to 375° and bake another 15 minutes until nicely browned. [Note: pastry will brown more quickly in a ceramic tray: reduce heat as needed.] Allow to cool on a rack, about 10 minutes. Serve with ½ tablespoon (or 1½ teaspoons) of low- or full-fat sour cream or yoghurt on top. Refrigerate uneaten cakes and use within a few days. Mix the blueberries and cinnamon into the paste. Using a normal tablespoon, portion out dollops about 2 inches or so across, allowing room for the pastry to spread a little. Preheat the oven to 425° (the high heat helps the pastry to rise). Bake for 10 minutes, then turn over with an offset spatula if the bottoms are getting very brown. [Note: pastry will brown more quickly in a ceramic tray: reduce heat as needed.] Bake another 10-15 minutes or until both sides are crisp. Allow to cool on a rack before serving. 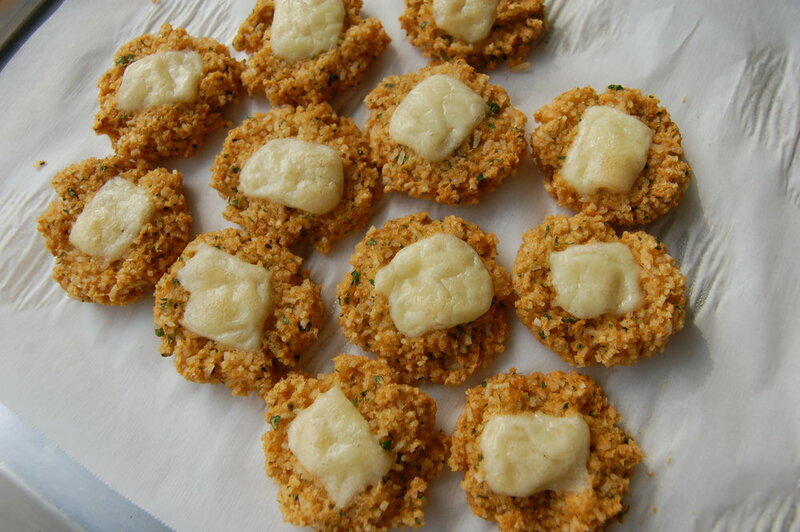 Make the choux paste and mix in the grated cheese, egg, and parsley, if using, until well blended. Use a regular tablespoon to portion out small balls of paste on a lined baking tray, about 1½ inches across and one inch apart. I recommend using a flat-bladed implement (such as a plastic ingredients leveller) to scrape all the paste out of the pot. Preheat oven to 425°. After 15 minutes, reduce to 375° and bake for another 10-15 minutes or until golden brown. Allow to cool on a rack before serving. This comes in two versions: a plain, breadless version and one that uses bread crumbs. The latter looks better to human eyes but the first is just as tasty and of course, is grain-free if that’s a concern for you. I think a little high-quality bread once in a while (I make my own in a jiffy with a bread machine) does no one any harm. The recipe can of course be doubled if you wish to use a whole apple. Version 1: Grate the apple into a dish, add the grated cheese, season, and pre-heat the oven to 320°F. Line a baking sheet with parchment paper and use your hands to form small balls (a bit bigger than the diameter of a Champagne cork is what I aim for, but it doesn’t really matter). The balls will spread as they cook. Set the timer for 15 minutes, then remove the tray from the oven. Allow them to firm up before gathering with a spatula. Breaded version: Grate the apple and cheese as directed in the first version. Also grate a slice of fresh bread into rough large crumbs, and add ⅛ teaspoon salt to the mixture. Follow the baking directions for Version 1. These balls will not spread as much because the breadcrumbs act as a binder.